The Rainger FX Echo-X digital delay pedal is a "major game changer for real-time control"
London's Rainger FX - famed for the Dr Freakenstein Fuzz, Air Traffic Controller et al - has unveiled its first delay pedal, the Echo-X, which promises to change the way we think about real-time delay control. 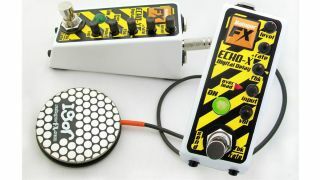 As well as a 540ms max delay time and treble and bass roll-off on repeats, the Echo-X comes packaged with Rainger FX's Igor pressure-sensitive foot controller, which allows users to manipulate echo speed and feedback, or act as a 'send' control to route clean signal to the delay circuit. This enables guitarists to keep repeats looping beneath unaffected clean signal, accent delay trails or activate on-the-fly UFO-style oscillations. Elsewhere, the pedal offers controls for echo level, rate, feedback, input and volume, all within a mini pedal-sized enclosure with true bypass switching and nine-volt power supply operation. The Echo-X is available now for £119 - head over to Rainger FX for more.